“The Pearl” is a large artificial island on a rounded neck jutting out into the Gulf waters just north of Doha. It is home to 12,000+ residents, several luxury hotels, and numerous dining and entertainment venues. Among the ten precincts, there’s the Qanat Quartier, a “Venice-like community” with extensive canal system, pedestrian-friendly squares and plazas. 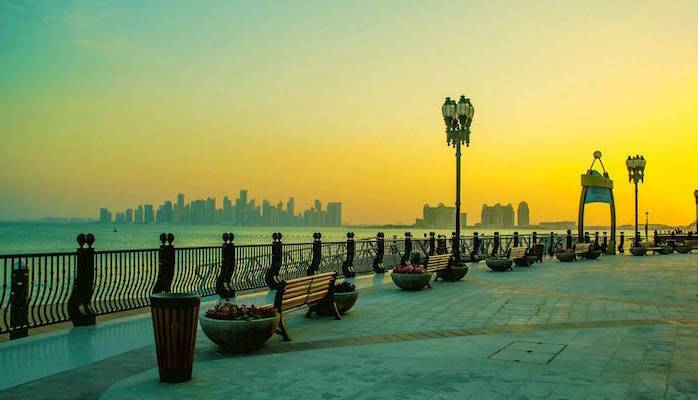 The Pearl is one of the better running spots in the Doha area. Traffic here is a bit lighter than the rest of town, so it’s possible to get in some good running along Pearl Boulevard and Porto Arabia Drive, which feature good sidewalks. We’ve mapped an 11.5 km out and back route that goes from the Public Beach, east to Bahriya Beach. For an add-on or some variation, run out to Isola Dana, a narrow path that juts 2.3 km into the middle of the sea. The Pearl and its 13 islands continues to be a work in progress, so running options will continue to expand!